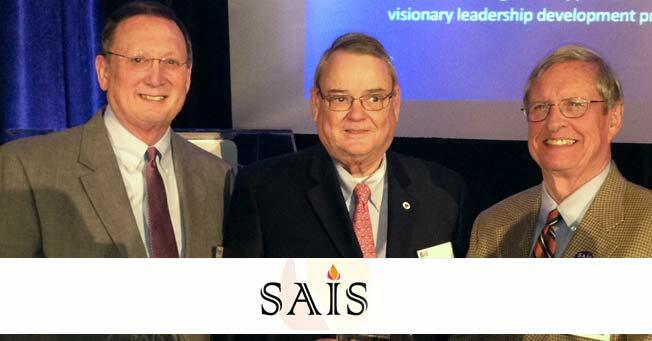 Peter Jernberg (left) receives the SAIS Distinguished Service Award Sunday, October 27, at the SAIS/MISBO Annual Conference in Atlanta along with Bill Jablon (center) from Maclay School in Tallahassee, Fla., and Bob Chambers from Athens Academy in Athens, Georgia. JA President Peter Jernberg received the SAIS Distinguished Service Award Sunday, October 27, at the Southern Association of Independent Schools/Mid-South Independent School Business Officers Annual Conference in Atlanta. The conference is the largest gathering of independent school leaders in the Southeast region representing over 500 independent schools. Given by the SAIS Board of Trustees to recognize long, distinguished careers in independent education, the award is presented to a head of school or senior administrator who has spent 25 years or more in service to a single school, as well as in service to SAIS.